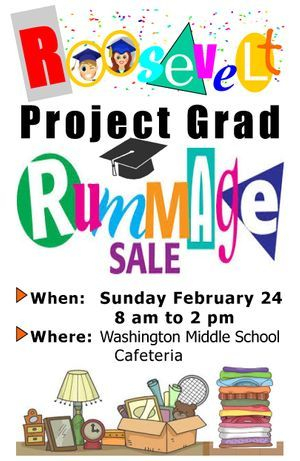 CLASS OF 2019 PROJECT GRAD IS ON THE GO! Volunteer now to ensure that this year's class has another safe, memorable overnight graduation celebration! Remember - someone else's trash might be your treasure! HELP OUR SCHOOL EARN SCHOLARSHIPS AND PROJECT GRAD FUNDS! Foodland will award 100, $2,000 scholarships and $15,000 in Project Grad funds to schools earning the most points! 2 - Just Shop! Everytime you shop you'll earn points for our school! 3 - Earn Points Faster by purchasing products with 2x, 3x or 5x points shelf tags! 4 - Tell Everyone! Ask friends, family and others to designate Roosevelt too!